Turmalin is an exclusive land right by the redpine forest its private swimming pools for each villa, landscaped gardens and central generator. 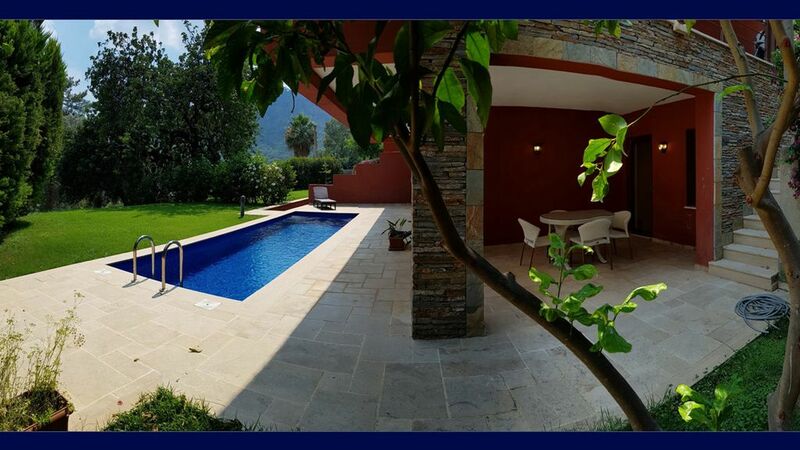 A Mediterranean climate, glorious tranquil surroundings, total relaxation and all your needs catered for in the security of a private development. With the most executive address in this enchanting Turkish resort village, rest assured, you can retreat here in style. Gocek Rentals offers rental motorboats and sailboats. Gocek Tennis Club boasts 4 clay courts to rival those at Roland Garros (Paris). A car is not a must but recommended. The apartment has exceeded our expectations. The spacious layout made us feel very comfortable with all good quality amenities at hand. We loved the pool access and spent there half day with the advantage of privacy and sea view! The neighbourhood is very calm and in private very high standards residency. There are many affordable nearby shops and restaurants, almost at your doorsteps but yet at distance so you can keep privacy and peace of mind. After a walk across the town and promenade we agreed that our the location of our apartment was affordable with luxurious and romantic touch. We want to go back there and only there. Even Oludeniz was nothing to compare to with what we got in Gocek thanks to Alpar's rental. My toddler daughter and mother also loved everything about the place.